I bought myself an accountability partner today – A Jawbone UP. 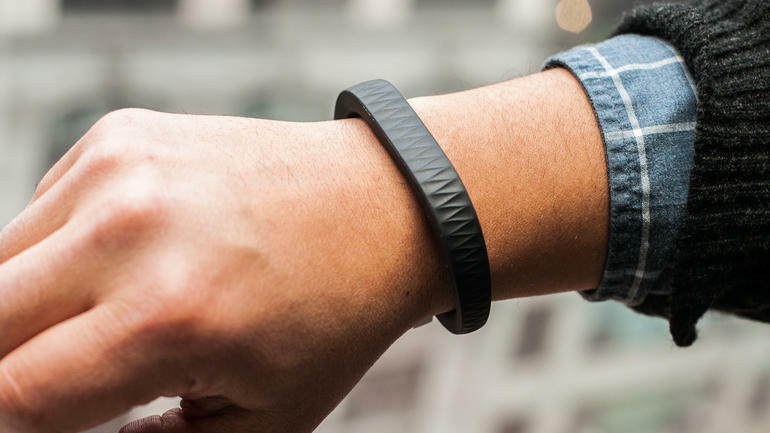 It’s very similar to a Fitbit tracking device that you wear on your wrist. This particular one was on sale and marked down significantly at Radio Shack, plus I had a coupon (that’s a sure fire way to get me to buy something, gotta have a coupon) for $10 off. A steal! Today is day #1 with this little gadget. I bought the warranty too because I heard how easily these things can bend and break. You would think since I’m somewhat anti-tracking when it comes to food that I would be against using this tool. But really, I’m anti-obsessive when it comes to tracking. I would hate for any of my clients to become a slave to numbers and tracking incessantly and worrying about each and every bite of food that they take. So when I first started tracking my intake on this, I estimated for the most part. For example, I probably had more than a cup of greek yogurt. It was maybe more like 1 and a quarter. But I logged it as a cup. Big whoop. I also put about a dozen craisins on my salad today. (Maybe it was more like 20, I have no idea). But I logged more than that. I also logged less cheese than I had on top of it. I would never sit there and measure each and every piece of food. Not unless I was planning on competing in the near future. For all intents and purposes, it’s fine to just estimate. Now as for my biggest vice, peanut butter. Yeah I was accurate with that one. I mean, one tablespoon is considerably different than 3 tablespoons (don’t judge me, you know you love PB as much as I do!!). As for activity, I know these things don’t track heart rate so it’s not really possible to get a good idea of how many calories I’m burning when I’m lifting or doing cardio but again, it’s nothing to be obsessed about. I’ll enter in my stuff and see what it spits out at me. 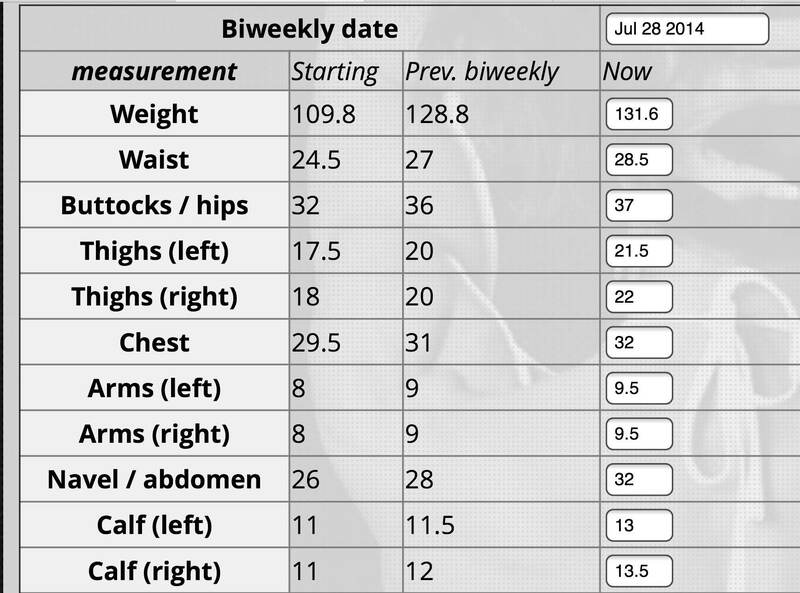 So here’s the biggest update since the beginning of this month: My measurements aren’t too terrible. I say “aren’t too terrible” because I’m not about to cry looking at them. I didn’t pick the best day of the month for a female to be measuring herself (sorry TMI) so I’m taking that little bit into account. But, although this isn’t indicative of someone who has been dieting, it’s okay. Because I haven’t been dieting! HA! If I’m being 100% honest I really haven’t been cutting too many calories at all, so this isn’t a huge surprise to see. This is basically my Bulk Phase 2.0. I didn’t even flinch at 4 INCHES gained in the stomach. I have to laugh…I mean, what can ya do? NOW, with my little Jawbone UP tracking tool, and a new goal of another photo shoot in the FALL, I think I should be able to lose a few inches. I think maybe finally I will start taking this seriously. I have definitely enjoyed my summer haven’t I? Ph well…moving on…yet again. At least this time I have a little buddy holding me accountable. Putting the fork down…and getting up off the couch. Moving on!